Viewers will need to head online for free highlights clips as the Champions League paywall is reinforced. 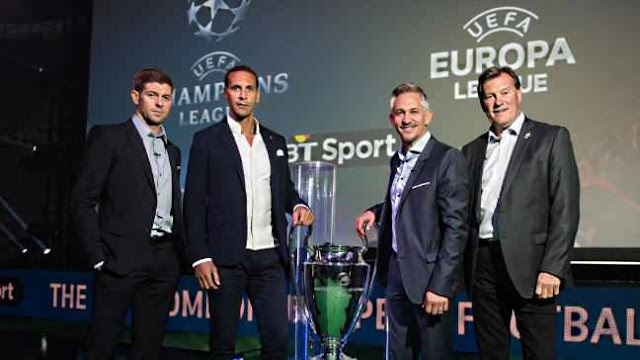 Three years after BT Sport first took over the pay TV rights for the UEFA Champions League and UEFA Europa League, the broadcaster's latest rights deal strengthens the paywall around live coverage, with no free-to-air broadcasts following the end of the BT Showcase Freeview channel last season. From this season, kick-offs are split: with fixtures either starting at 5:55pm or 8:00pm. Coverage in the UK will be exclusively through BT Sport, either via its main pay TV channels or via online streaming for subscribers via BTSport.com or the BT Sport App. An enhanced video player will enable subscribers to join the match late, and watch delayed coverage 'as live'. Details of which games are shown on what BT Sport channel can be found at BTSport.com. A highlights package of each game will be available online in HD following each fixture. The highlights package will be available via BTSport.com and the BT Sport App, and will be free to access for UK users. From this season any other freebies are due to be offered online-only and will be announced by BT. For subscribers, a regular televised highlights programme will be available on BT Sport from 10:30pm on match nights. Viewers can subscribe to BT Sport if they have Sky, BT TV and Virgin Media. BT Sport's linear channels are also available in the UK via Plusnet TV and through TalkTalk TV, despite BT omitting these services in much of their publicity. Viewers who solely rely on Freeview or Freesat will not have access.